Well, not really— but I have seen a serious proliferation of these fliers in the neighborhood recently. This suggests there is a problem. I have not seen ’em here— but perhaps, gentle readers, you have? 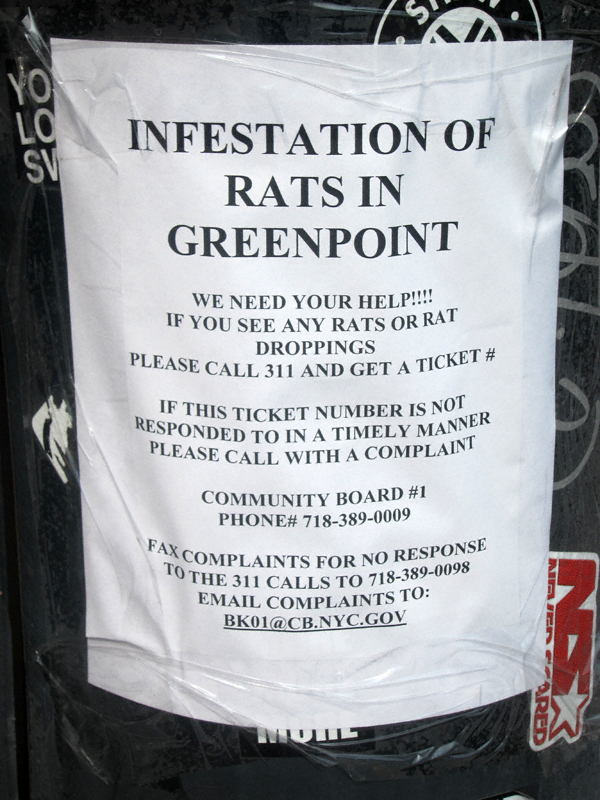 If so, please send me your rat spottings, rat travails or, best of all; the 411 as to why this campaign has been initiated in the first place via comments or email at missheather (at) thatgreenpointblog (dot) com. Your identity will remain anonymous if you so desire. It’s not Manhattan Ave, but there is someone living illegally in the warehouse on the southwest corner of Nassau St. & Banker St. who is dumping huge piles of bread crusts & pieces every morning to feed the pigeons. I have seen her twice and commented that it just brings on the rats, but get a dirty look. I have tried to report it to 311 but because I cannot figure out what the correct house or building number is, they cannot take my complaint. That corner is already neglected with piles of trash and overgrown weeds in the tree-less tree pits, it is prime rat hiding ground. They aren’t just scattering a handful of crumbs, these are big piles of bread chunks. I wish there was something that could be done. My neighbor put these up– she lives on Calyer near McGuinness. But the problem is rampant for at least a three block radius. There is a network of rat colonies running in between the yards, and it is almost impossible to control since it extends between properties, and goes unchecked in the vacant lots. I live on Leonard btwn Meserole and Calyer– we killed 36 in our yard last summer (we are ok this year, post-an embarrassing Rat Busters appearance, but I’m sure it’s just a matter of time). Our neighbor two doors down, next to an empty lot, killed 57 since last summer. The woman who put up the fliers has killed over 20. At least on our block, ground zero seems to be an empty lot at 689 Leonard Street. Eckford St has a giant lot that is also a problem, and the lovely rat hotel (http://articles.nydailynews.com/2010-11-07/news/27080545_1_rats-property-taxes-brooklyn-building). I’ve lived here 8 years and last year was the first year we had any trouble–I’ve wondered if some of the recent construction projects kicked up a dormant colony? Not sure, but the strangest thing is the appearance of giant white rats mixed in with the regular Norways (one of our neighbors has pictures). Despite numerous 311 complaints, nothing changes. I’ve tracked many of my own calls, and they are listed as “resolved,” but I know full well the inspectors never came, or did an extremely cursory job inspecting the property (e.g. if my complaint is about an infestation in a back yard, how can you claim you inspected the property if you never rang the doorbell and don’t have access to the yard??). But it appears flurries of 311 complaints are our best defense. This is the only thing that the Community Board seems to respond to. So if I might make a plea to your readers– if you do have a similar situation, make many, many 311 complaints. The owners of the property will receive notices and tickets to clean up and seek treatment. Track the numbers and send unresolved/poorly resolved complaints to the community board (info on the flyer above). And if you have a backyard, please take a look around. I was extremely unpleasantly surprised when I learned that the rats were burrowing underground, with a runway going between our yard and our neighbors, behind some bushes. Look for droppings or suspicious holes and clean up any debris, nesting materials, etc. And whack anyone who puts loaves of bread outside over the head. Sorry for the long post. Rats make you crazy…. September 15, 2011 6:30 p.m. It doesn’t: it falls under Environmental Protection and Ryan Kounan is the “go-to” person. No meetings of this sub-committee appear to be scheduled this month. Given that the Combined/Public Hearing is on the 14th, I suggest you attend that instead. NOTE: You have to sign up to speak by 6:15 p.m. The powers-that-be are downright obnoxious about this. September 14, 2011 6:30 p.m.